Why should I join the journey? We are fighting for a good cause, raising funds to support disadvantaged communities in Northern Malawi. We are about connecting you to others and giving ourselves to this unusual and rewarding journey to encourage your friends and family to donate to our charity fund, the people of Malawi need you! What is the Rock N Rumble Charity Wrestling night all about? Rock N Rumble is the world’s first white collar wrestling event. In ‘zero-to-hero’ style, Rock N Rumble Wrestling wants to train you up to put on the show of your lifetime. 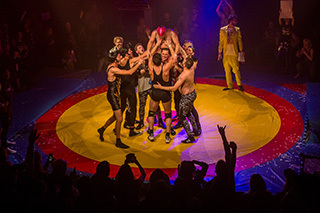 In a completely original format combining elements of WWE style prowrestling with pure olympic freestyle wrestling, you and your team will be putting on a hilarious show whilst also hitting the grunt and grind of a full blown grappling competition in front of a packed crowd of friends, relatives and Rock N Rumble fans. Crucially, all your efforts will be raising money for charity, helping you give something back to the world. The is Wrestling for Humanity! Its funny, its loud, its competitive, there is no other show like Rock N Rumble, sign up today and take part. Don’t miss out on taking part in the second ever Rock ‘N’ Rumble. Come along to our next TRAINING INDUCTION EVENING on the 11th APRIL @ The Bristol Dojo, 1-21 Bedminster Down Rd, Bristol BS13 7AB. 7-10pm. Here you will get to meet the whole team, some former contestants, find out more about the format of the event and take part in a two hour training session with our star Coach Saeed Esmaeli. Our other upcoming competition nights are listed below, however Rock N Rumble wrestling is coming soon to a town near you, do sign up to register your interest. Rock n Rumble was one of the craziest, enjoyable, rewarding and tough challenges I’ve ever taken on. The pleasure of learning something new, the adrenaline of preparing for the ring, the late nights crafting my fancy dress and the most amazing crew of comrades, coaches and support team. Me & my partner raised over £1000 between us! This felt pretty incredible. You’ll never regret stepping up to this one – give it your all, give it some heart and you won’t be disappointed. My only problem now is I’m wondering what I’ll do without it in my life. – I’ll still be wrestling in future for sure. When I signed up for Rock’n’Rumble I didn’t really know what I was getting into! I just knew I was taking part in an opportunity to raise a lot of money for an amazing charity. What I actually got out of it was far more than that. An incredible bunch of crazy people who will remain friends; a patient, qualified and fun coach (with an amazing support team) who taught me something I never thought I could do in a million years and an event which my family and friends loved! I would 100% recommend Rock’n’Rumble to anyone…. I wish I was doing it again!